It is exciting times in the electric bike world! To prove that I would like to introduce you to the innovative eFlow E3 Nitro electric bike. seat tube, on the down tube, in the down tube, in the top tube(s), in a hub, and now in the seatpost! 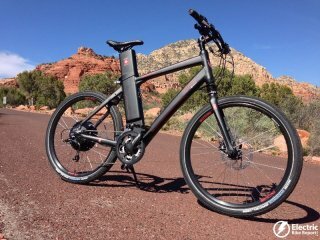 The battery is one of the heaviest and most expensive components of an e-bike and it is interesting to see all the different designs evolving from this relatively young industry. In addition to the unique battery location the eFlow comes with a 500 watt direct drive motor with regenerative braking, quick release rear wheel, RST suspension fork, LCD display with backlight, quality components (SRAM, FSA, Tektro, Maxxis, etc. ), throttle or pedal assist, and more! Make sure you check out the video, large detailed pictures and specifications of the eFlow E3 Nitro to get familiar with this unique e-bike. 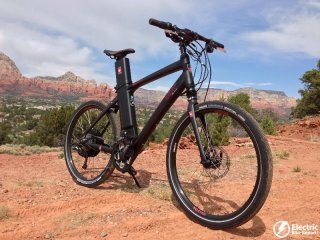 This full review of the eFlow will give you an idea of the ride characteristics, range test, pros, cons, and overall thoughts on this new innovative e-bike. The E flow is a very nice, high-quality, sporty commuter, zip around town and/or country bike. It has the efficiency of road bike with the more upright comfortable position and wider tires similar to a mountain bike. I found that getting around town on the eFlow was a quick and fun experience. It is a very smooth and solid feeling bike that could be related to a high quality sports car. The ride feel is very smooth and powerful. 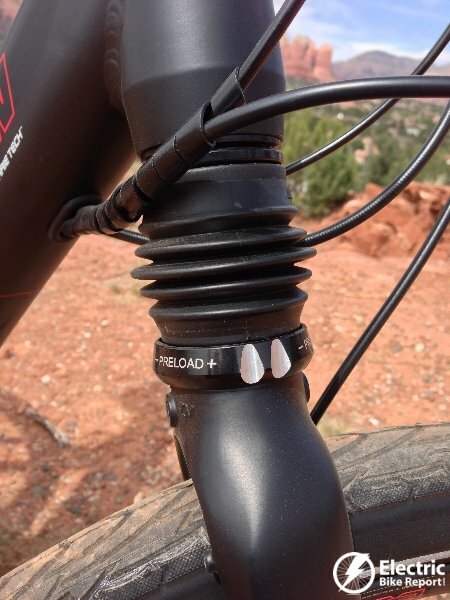 This is most noticeable in the pedal assist setting (PAS) because the system really amplifies your pedaling efforts. 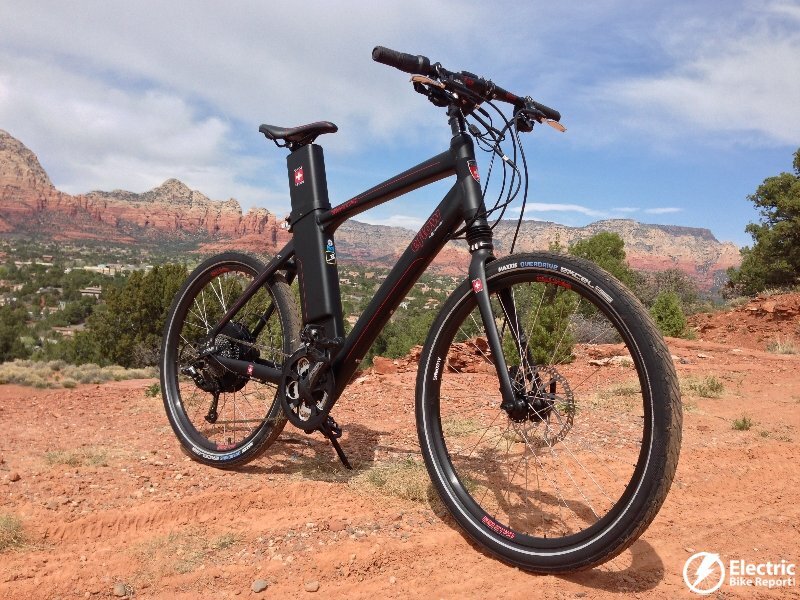 The pedal assist system uses a TMM4 torque sensor in the rear dropout of the frame and the pedal assist feel of the eFlow is dialed in with smooth accelerations and assistance once you are up to speed. In the PAS mode you can still turn the throttle for a little additional boost up hills or when accelerating. All of the pedal assist settings (1 through 4) provide a significant amount of power. It would be nice to have even less assistance at the very lowest setting for riding in slow in congested areas. The bike also has the pure throttle option, which is called Power-On-Demand (POD). In this setting you can turn the throttle and cruise along without pedaling if you want. Personally I did not find this setting to be as much fun as the pedal assist mode. The pedal assist mode just has a quicker, more exciting feel. The 500 watt direct drive motor from TDCM had a very smooth feel to it and it was pretty quiet once it got up to speed; however there was some noise from the motor when accelerating. Initially I thought I would feel the weight of the battery more in the overall handling of the bike but for the most part it wasn’t very noticeable. With the battery in the seatpost and in line with your weight on the bike, it feels pretty good as far as overall weight distribution. When standing out of the saddle and swinging the bike side to side, I could notice it a little but for the most part I did not notice it at all. Speaking of the sporty ride, if you have your foot on the pedal while you are at a stop in PAS mode and you don’t have the brake levers engaged the pedal assist system will engage and start to move the bike forward. This is pretty easy to get used to and the solution is to squeeze the brake levers while stopped so the electric system won’t engage. The eFlow has regenerative braking that is engaged by squeezing the front or rear brake lever. This braking system recaptures some energy by turning the motor into a generator to add some juice (electricity) back into the battery pack. The LCD display on the eFlow is very nice. It is centered on the stem and it is very easy to see during the day. There is also a backlight feature for when you’re riding at night. The display allows you to change between the throttle (POD) and pedal assist (PAS) modes by holding down the + button for 3 seconds. In addition the display shows the battery level and traditional cycle computer info like: current speed, max speed, average speed, trip distance, odometer, time, trip time, and total time. To adjust the pedal assist setting you need to cycle through to the power levels on the display and adjust it via the plus or minus buttons on the display. It would be nice to have the ability to adjust the pedal assist settings from a simple control on the handlebars instead of the buttons on the display at the stem. The display has a handy quick release option too. Simply twist the display 45 degrees to the left and it pops off. This will discourage theft but you still need to lock up the bike! The hydroformed aluminum frame looks like it is well built with large tubing and solid welds. The eFlow also has internal cable routing to make for a clean overall design. Since the frame is constructed from aluminum and there is no way to install a suspension seatpost you definitely feel a lot of the bumps and cracks in the road. You could buy a more cushy saddle to take the edge off of the rough roads. The RST front shocks definitely helps absorb some of the bumps and cracks in the road. When the fork is bottomed out (fully compressed) after coming off of a curb there is a clunking sound. It would be nice to have an elastomer bumper so when the fork bottoms out you won’t hear that noise. The Tektro Augira hydraulic disc brakes offer quite a bit of stopping power and they also have the electric switches that will activate the regenerative braking mode and stop the electric assist even if you still are turning the throttle. 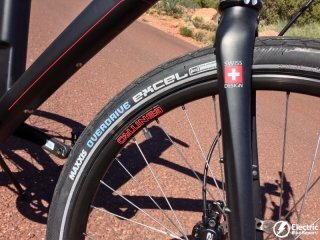 The Maxxis Overdrive Excel tires have a very fast yet comfortable road feel. Since they are 2″ wide they helped to smooth out the rough roads and provide a relatively stable ride. One note on locking eFlow. 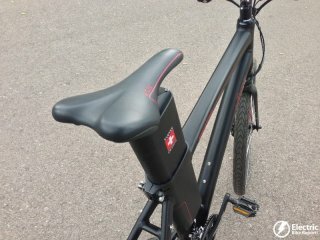 Since there is a quick release on the seat post it could be very easy from someone to steal your battery and seat. Whenever I locked up the eFlow I looped the cable through the seat rails. Chances are a thief wouldn’t steal the battery because it is pretty specific to just eFlow bikes, but you never know. 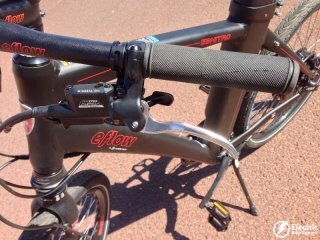 Overall, the eFlow seems to be pretty similar to the Stromer electric bikes. It has a very high-quality feel to it and it also has that similar sporty commuter style as well. Here is the real world information on how the eFlow E3 Nitro electric bike performed on my typical riding circuit that includes hills, flats, traffic, wind (when available) etc. Range: As you can see from the GPS info that I recorded, the eFlow traveled 22 miles and did a total elevation gain/loss of around 2,000 ft. Considering that I weigh 190 lbs and I pedaled very lightly this is pretty good range for a 36 Volt 10.75 ah battery pack (387 Watt Hours) with a 500 watt motor! If you want more range, the eFlow has an optional upgrade to a 36V 14.5 ah battery pack available for any frame size later this year. Speed: The eFlow travels up to 20 mph on throttle only and in pedal assist mode it can be comfortably pedaled above 20 mph with the motor still providing some assistance. It also climbs hills pretty well. On the steep hills you will need to give the motor a little pedaling help, but for moderate hills you can pedal lightly or just turn the throttle and sit back as the bike takes you up the hills! Weight: This bike tips the scales at 52 lbs. The weight distribution on this bike is a bit back heavy with the battery in the seatpost and the rear hub motor. Despite the battery being relatively high, the handling of the bike still performed well. I think it is because the battery is in line with the majority of your own body weight. Innovation: It is cool to see the eFlow pushing the design envelope with the battery in the seatpost. It provides a unique and clean look and it is definitely a conversation piece! 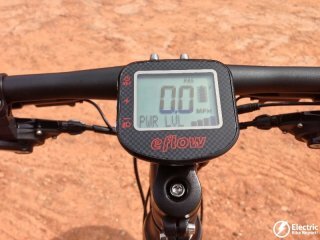 It is exciting times in the e-bike world and the eFlow is pushing the limits of what an e-bike can be. Refined Ride Feel: The eFlow has a smooth and solid ride feel. It also was pretty sporty and fun to ride. The overall design and component package make for a nice high quality bike. I looked forward to and enjoyed every ride! Quick Release: The rear wheel has the Axle Release quick release levers and a quick motor cable disconnect. These make removing the rear wheel very easy for changing a flat or loading the bike into a car. A true quick release rear wheel is a relatively new feature in the e-bike world. Quality Components: The Samsung lithium ion battery, SRAM Apex drivetrain, the Tektro Augira hydraulic disc brakes, FSA cranks, Maxxis Overdrive Tires are all nice components for the eFlow. Limited Accessory Options: The battery placed in the seatpost prevents you from using some traditional bicycle bicycle accessories. For instance you can’t use a suspension seatpost, traditional tail lights, or the Burley Travoy trailer because these require a traditional seatpost size. I guess there are some sacrifices that need to be made for innovation! Pedal Assist Settings: It would be nice to have a lower pedal assist setting for navigating crowded areas where there are a lot of other bikers and pedestrians. The lowest pedal assist setting on the eFlow still had a bit too much get up and go for crowded areas! 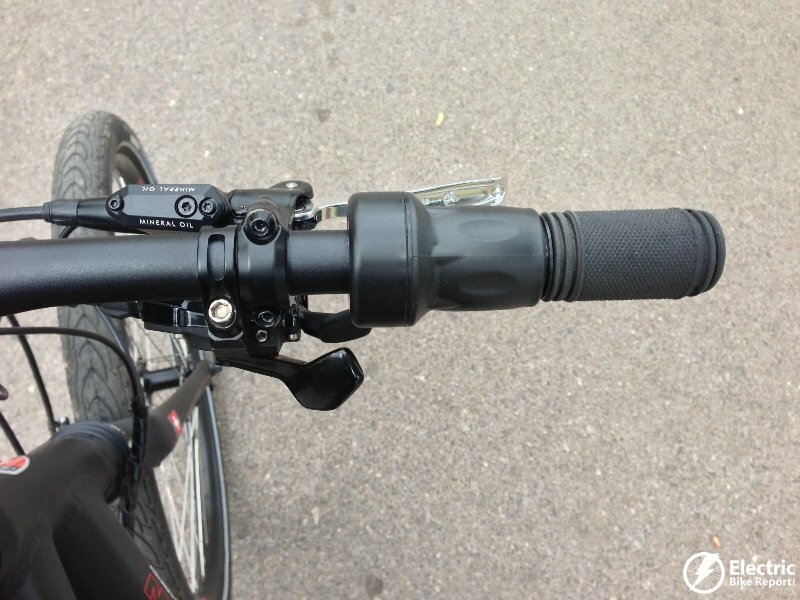 It would also be nice to be able to adjust the pedal assist levels from a button close to the grips on the handlebar instead of having to take your hands off the grip to adjust the assist level at the display. Motor Noise: At the lower speeds and when accelerating there is a bit of noise which was a little surprising considering that it is a direct drive motor. I got used to it pretty quick but it is something to be aware of if you are noise sensitive. Overall I really enjoyed riding the eFlow electric bike. 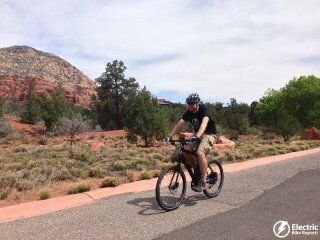 It’s fun to ride one of newest cutting edge e-bike designs! The eFlow is a sporty, urban style e-bike that makes getting around town a lot of fun. The combination of road bike efficiency with some mountain bike features makes the eFlow a sturdy e-road machine. Just be aware that with a unique battery seatpost design comes some limitations with some bike accessories. And it would be nice to be able to adjust the pedal assist settings via a control near the handlebar grip. I hope this review has given you a virtual idea of what the eFlow electric bike is like. And hopefully it has given you an idea of whether it is the bike for you! The eFlow E3 Nitro retails for $3999 at the time of this review. Where to buy the eFlow? Check with Currie Technologies for a dealer near you. Do you have any questions about the eFlow E3 Nitro? Do you own the eFlow? Please share your thoughts in the comment section below.